Clint was professional and knowledgeable. I am very satisfied with the service as long as Clint is the tech. The only downside is that the company request my credit card on file. I prefer to be receive my bill online instead. I’ve had excellent service from this company!! This is my first year with them and I’ve been very pleased. They come out when promised and call ahead for reminders! Thank you !! Technicians were prompt, friendly and courteous. This was our first service with Active and I am glad our realtor recommended them! Great customer service and knowledgeable technicians. Great service. Lawerence is great and provides friendly, great customer service. Active Pest Control is reliable in all ways. Active is always responsive, the techs are knowledgeable and attentive, and the pricing is very reasonable. We’re very happy with our pest and termite service! Great service...they’ve got my home under control! Excellent service, very professional, personable and thorough. I just wish that they would come bye when someone is home. Clinton did great job on pro pest control service and took time on explaining the details. I am very satisfied with his work quality, efficiency and friendliness. I will recommend Active Pest Control to my friends too. Best company from top to bottom, get the job done at the best price. We have not had any pests and I don't have to stay at home once every two months to let them inside. They do everything outside. Tim came out, and was very professional. He was nice and attentive to our concerns. Bug control is effective, especially the fire ant mounds!! Thanks, we'll look forward to signing up again soon. Definitely recommend! Also, thanks to Alicia in the office that made our appointments! Jeremy (the technician) is a trooper and a thorough installer. Even after unearthing a nest of yellow jackets and getting stung 4x he still finished the job. Both the inspector and the tech were professionals in their jobs. Always on time and thorough! We’ve been with Active for at least 10 years. They’re great! After a treatment, I had ants in the bathroom. The technician who did the initial treatment told me to call if I saw any insects. As always, calling Active to schedule another treatment is not an issue. They try to schedule as soon as possible. Technician calls to let me know when they will arrive. Each technician is polite and addresses concerns in a professional way. I appreciate the service provided by Active Pest Control. Very reliable, competent company, with friendly, professional, and capable technicians! You are very prompt and detailed! Looking forward to a great relationship. Prompt service and fair pricing. Great company to do business with. Have had Active for years and love them! Thanks for the quality of work you do! Great customer service! THANKS! LW2. 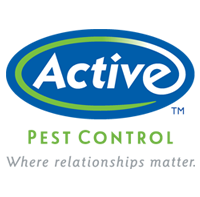 Active helped solve a big pest problem for us. Revisits were timely too. Thanks Active. I don’t have one bad thing to say about this company. Bought a special on Groupon and they came for the inspection and treatment right on time. Everyone was courteous and professional. Delivered what was promised. I would recommend and definitely use them again. Thus far Active has been a very good pest/mosquito service. I haven’t experienced the mosquitos so far that some are seeing. Pleased with the service Active Pest Control did at our house, recently. Most of the time they're great !! They listen and cared what you say to solve the issue. Very happy with the service and price! We have received great service. No complaints!